Nothing beats the excitement and novelty of your very first real job. With your long-awaited degree in hand, the world is at your fingertips! You can do it all – and you will. But first, you need to land that perfect job. For that to happen, you’ll need to get through an interview looking poised, polished and professional. Whether,you’re preparing for your first real job or you’re just looking for part-time work to make some headway on your student loans, we’ve got you co vered. Check out our handy list of interview tips and get ready to make your best impression! Research – Find out all you can about your prospective workplace. 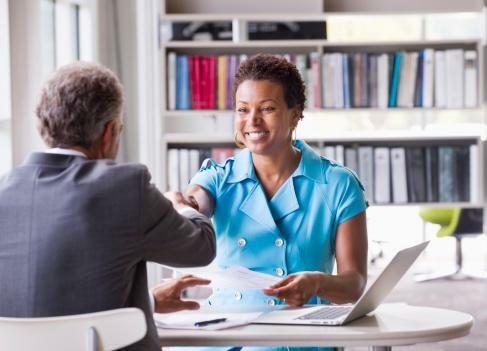 Showing that you’re familiar with the company, its goals and its successes will impress your interviewer and help you display a keen interest in the company. This way, you’ll be prepared for the questions the interviewer will throw at you during the real thing. Be professional – Dress to impress. You want to look respectable and mature, so look the part. You don’t need to wear a suit unless the particular workplace calls for one, but you can look sharp and professional in a buttoned, collared shirt, or a nicer blouse and slacks. Also, be sure to show up at least 10 minutes early. Prepare everything you’ll need the night before so you’re not frantically searching for your keys a half-hour before you’re supposed to meet with the big boss. Make sure you know how to drive to the office without getting lost. If it’s in an unfamiliar part of town, input the address into Waze or another GPS app the day before the interview and do a practice run to be sure you’ve got it down pat. Finally, use respectable language only, keeping away from slang, vague, meaningless words like “um” or “whatever,” and, of course, all swear words. Act confident – This is where your latent acting skills come into play. You may be quaking at the knees, but you’ll need to present yourself as a confident, assured employee. Your handshake should be firm. Look the interviewer in the eye. Answer questions in a strong, certain voice. Employers want to see strength and poise; show them you’ve got it! Follow-up – Later that day, send the interviewer a quick email thanking them again for their time, being sure to sign your name. This way, they’ll remember you from among the dozens of potential employees they may have met that day.